Having come back from ship and rejoiced in having my lovely comfortable bed back again, I then had to pack up my stuff again as I have moved. For the first time in about 5 years Nikki and I are officially living in different houses! I have moved to near Poole to help look after my grandparents. Thankfully Nikki was lovely and drove me over there and thankfully we managed to squeeze everything in the back of her tiny car! After moving everything in and helping me set up a few things she decided driving back that evening was a bit of a mission and opted for one of the 4 air beds that we had in the house courtesy of our parents. When all three of us (Ed was staying as well) woke up in the morning complaining about how bad the nights sleep had been we decided that new mattresses were in order! A “short” trip to IKEA later I now have a mattress to sleep on and a few other essential things for the house. It is weird how used to having things you get, I keep thinking I have things them remembering I didnt bring that with me. I am currently on the hunt for a large saucepan and a set of scales as this house has two apple trees and a grape vine so I am going to make some grape jelly! I apologise for the awful photo, but look grapes! One thing that moving has done is force me to look at the amount of stuff that I have, between Nikki and I we sent 4 bags of clothes to charity just before I left at least two of which came from me looking through my stuff before packing it, throwing out anything that didn’t fit me or was just not my style anymore. I am looking to reduce the amount of clothes I own and try to make a lot more of it. I also need to reduce the amount of crafting stuff I have – namely fabric – and the Craft Sessions series about ‘stashing less’ is really making me think hard about this! 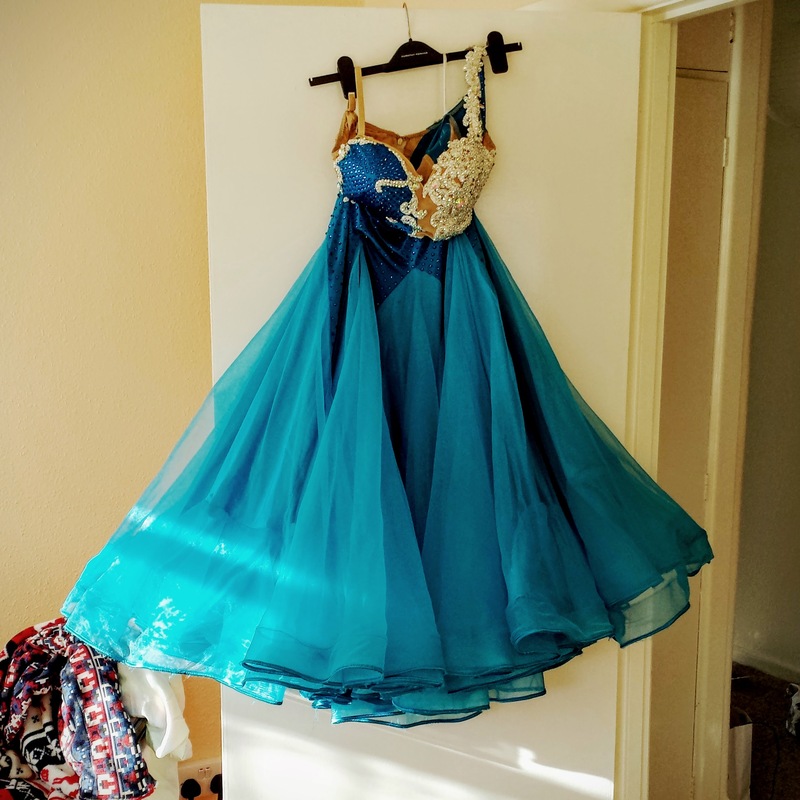 In payment for Nikki moving me over here I have agreed to take up her Ballroom Dress, so far I have cut the crinoline off the bottom of the outer skirt. There is about 15m of it! and that is just one of the four layers! So here goes nothing, lets see how living in a completely different town goes!